Because the obstacle to adopting this approach has been concern about its fairness, we also looked at driver incomes. Would congestion-based charges price the poor off the road for the benefit of those who can pay? We calculated how different systems of road use charges affected households on different incomes, and how driving patterns changed under different prices. The evidence does not support other common policy responses to traffic congestion. Building new roads does little to relieve congestion. Placing tolls on roads can push traffic onto others. However, even small reductions in congestion can produce large benefits. On congested roads, reducing traffic by 5% can increase traffic speeds by up to 50%. The question is: what would the optimal charges be? Drivers often plan their travel ahead of time, so Uber-like surge pricing is not necessarily the best way to go. Could simpler fixed charges, based perhaps on time of day or location, be effective? In 2015-2016, Transurban Group implemented the Melbourne Road Usage Study (MRUS) to answer these questions. More than 1,400 drivers across greater Melbourne installed GPS devices in their vehicles for eight to ten months. After a period to establish baseline use, a randomly selected subset faced a series of road use charges via a system of virtual accounts. Every month participants accumulated real money from reduced charges as a result of their decisions about driving. a distance-plus-cordon charge where drivers were charged 8 cents per kilometre at all times plus A$8 if they entered the inner city. Our working paper, Can Road Charges Alleviate Congestion?, evaluates the raw data. Charges that vary by time of day were most effective at reducing driving at congested times. Drivers subjected to a higher cost of driving in the weekday peak hours of 7am to 9am and 3pm to 6pm reduced travel by 10% during these periods. 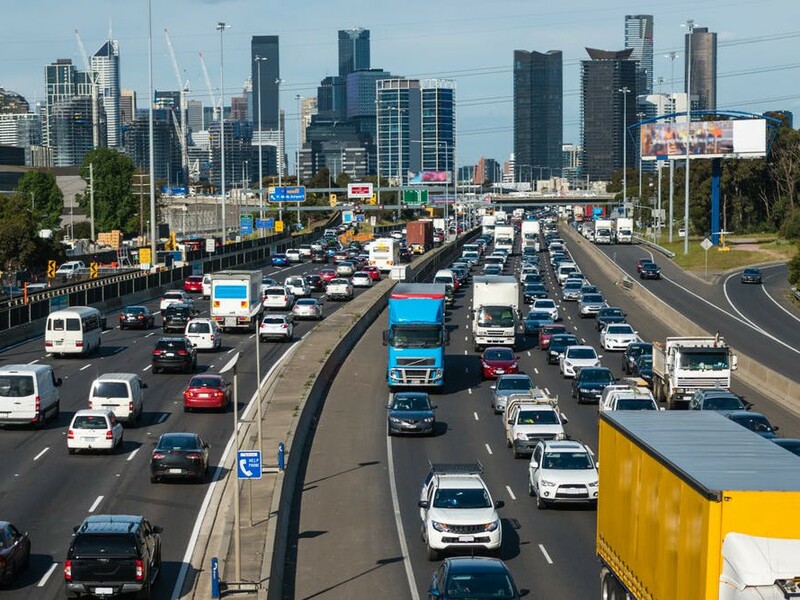 While a simple 10 cent charge on distance travelled did reduce driving, this was mainly outside the congested inner city and at off-peak times – mostly in the middle of the day and on weekday evenings. Most freeway congestion occurs around morning and late afternoon commutes. London and Singapore have charges to enter the congested city centre. Further research is needed to assess the effects on inner-city traffic in Australian cities. The evidence points towards most drivers who enter the CBD being willing to pay higher weekday charges. But few drivers entered the cordon zone during the study. Less than 5% of the drivers made over half of the trips into the area. Public transit has a key role in getting cars off the road. Our data showed households located far from the CBD and from public transport drive more. Living 500 metres closer to a tram or train station has the same effect on kilometres driven each day as living 5km closer to the CBD. Households within a 10-minute walk from public transport drive least. The largest reductions in driving from time-of-day and cordon charges come from households living 10 to 20 minutes’ walk away. Congestion-based charges can be a more progressive way to fund roads than the existing system of registration fees and fuel taxes. The fuel excise makes up almost half of the average annual road bill in Australia. It’s essentially a distance-based fee, but more fuel-efficient vehicles pay less per kilometre travelled. Hybrid vehicle drivers, for example, contribute much less to fuel tax revenue. Yet, although hybrids contribute less to air pollution, they increase congestion just as much as their petrol-guzzling counterparts. And congestion is a much greater shared economic cost than vehicle air pollution. Annual vehicle registration fees make up most of the remaining road bill. These provide no incentive to reduce congestion. Fuel taxes and registration fees put a disproportionate burden on low-income households in the outer suburbs. Our research shows these households would be better off if roads were funded more by congestion charges. So what is the optimal congestion charge? Economic theory (Pigou 1920) tells us to price at the cost that each extra user imposes on the system. With road use, though, the calculation is difficult. To fix rates in advance, we would need to know exactly how much longer everyone’s trip is when each extra driver joins each system. And we’d need to cost that slowdown for each individual on the road at that time (i.e. value their time and, potentially, the cost to them of being late). New research has been using clever experimental designs to identify these values. That said, maybe it is not too important to get the price just right. For electricity, we are starting to see that households respond to there being a price, not its specific level. Before widespread road use charges are implemented, we would like to see more field experiments like the MRUS to find answers to other questions. Would it be better to combine a time-of-day charge with targeted locations? How effective would it be to charge more for using highly congested arterial roads at peak times? Would this simply push congestion onto nearby local roads? How large a gap between peak and off-peak prices is needed to produce a strong response? Another interesting option is the i10 model outside Los Angeles. Two lanes are for traffic willing to pay more to get to their destination faster. Dynamic pricing ensures traffic in these lanes flows freely – if too many use these lanes and traffic slows, the price increases. Drivers can decide every few kilometres if they want to pay more to stay in the express lanes. Those who must get somewhere on time are able to, and the fee revenue can be used to reduce road costs for others. The Melbourne Road Usage Study (MRUS) shows field experiments can help us design better road use charges. By all appearances, households took it seriously and were positive about their involvement. The MRUS provides evidence that well-designed road use charges could help reduce congestion by encouraging people to drive at different times, take other routes or use other transport. This could lead to better use of existing infrastructure, thereby reducing costs, while generating revenue for infrastructure investments. Under such a system, drivers who contribute little to congestion could see substantial gains.